Lipoprotein(a) (Lp(a)) is an internationally recognized atherogenic risk factor which is inherited and not changed by nutrition or physical activity. At present, only proprotein convertase subtilisin/kexin type 9 (PCSK9) inhibitors may modestly decrease its concentration (but not in all patients)—leading to a certain decrease in cardiovascular events (CVE) in controlled studies. However, at present an elevation of Lp(a) is not a generally accepted indication for their use. More effective is lipoprotein apheresis (LA) therapy with respect to both lowering Lp(a) levels and reduction of CVE. In the future, an antisense oligonucleotide against apolipoprotein(a) will probably be available. Atherosclerosis in patients with an elevation of Lp(a) may affect several vessel regions (carotids, aorta, coronaries, leg arteries). Thus, Lp(a) should be measured in high-risk patients. These patients are usually cared for by their family doctors and by other specialists who should closely cooperate. Lipidologists should decide whether costly therapies like PCSK9 inhibitors or LA should be started. The main aim of current therapy is to optimize all other risk factors (LDL cholesterol, hypertension, diabetes mellitus, body weight, renal insufficiency). Patients should be regularly monitored (lab data, heart, arteries). This paper describes the duties of physicians of different specialties when caring for patients with high Lp(a) concentrations. Lipoprotein(a) (Lp(a)) was detected in 1963 . It contains an LDL particle to which apolipoprotein(a) is bound. In the 1990s studies showed an independent association between elevated Lp(a) levels and the incidence of cardiovascular events [2, 3, 4]. Recently, more epidemiological studies have documented the atherogenic risk of increased Lp(a) concentrations [5, 6, 7, 8, 9, 10, 11]. This risk has been confirmed by studies using a Mendelian randomization and genome-wide associations [6, 12]. Mechanisms leading to atherosclerosis include direct atherogenic, proinflammatory and procoagulant activities. However, they are not yet completely understood . It is of note that aortic valve stenosis is another possible consequence of high Lp(a) concentrations . The incidence of elevated Lp(a) concentrations in a given population depends on the criterion which is used. Assuming a rather high cut-off level, elevated Lp(a) levels were observed in 10 to 20% of a given population [5, 12, 15]. Lp(a) is not influenced by nutritional factors or by physical activity. A hormone deficit in postmenopausal women or renal diseases may increase its concentration. Patients with a familial hypercholesterolemia often show elevated Lp(a) levels . There is no doubt that not all subjects with high Lp(a) levels show atherosclerotic lesions. The reasons are still quite unclear. The composition of Lp(a) particles may be different. Additional factors most probably play a role: a positive family history with respect to early cardiovascular events in first-degree relatives, cigarette smoking, hypertension, elevation of low density lipoprotein cholesterol (LDL-C), diabetes mellitus, or a procoagulative situation. Thus, a healthy lifestyle and in many patients drug therapy are required to avoid or to minimize these additional factors in persons with an elevated Lp(a) risk. Routine measurement of Lp(a) levels in a general population is challenging due to financial reasons. Measurements should focus on individuals with high atherogenic risk as listed in Table 1; [17, 18]. In 2017, Afshar and Thanassoulis  also suggested to measure Lp(a) levels in patients with LDL-C levels above 3.5 mmol/l (135 mg/dl), who would otherwise not qualify for statin therapy based on available guidelines. At least in Germany, Lp(a) is recognized as an atherogenic risk factor. In 2008 the Joint Federal Committee (Gemeinsamer Bundesausschuss) accepted an isolated elevation of Lp(a) as an indication for lipoprotein apheresis (LA) therapy  which is a prerequisite for being reimbursed by health insurance companies. Fig. 1 depicts the authorities, institutions, societies, organizations, and persons involved in the management of patients who were identified to have an increased cardiovascular risk due to elevated Lp(a) concentrations. As Lp(a) is not yet well-known in the population and especially among treating physicians, this paper aims to give an overview about the current situation concerning the diagnostic and therapeutic options. Fig. 2 summarizes the medical specialties involved in the care for patients with elevated Lp(a) levels. The vast majority of these patients are seen as outpatients, but severe complications like myocardial infarction, stroke or vascular interventions require hospitalization. Physicians marked in red in Fig. 2 play a prominent role when attending patients with high Lp(a) levels—their tasks are described in more detail in the following. 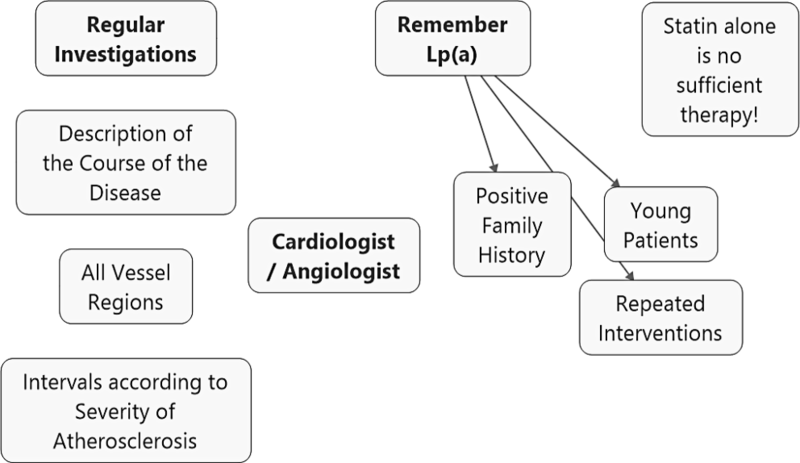 The family doctor usually knows the family history of his patients very well and thus can identify high-risk patients whose first-degree relatives suffered from a cardiovascular event at an early age (less than 60 years) or who have high Lp(a) levels. He should also consider checking Lp(a) levels of other family members who have not yet suffered a cardiovascular event (Fig. 3). Many family doctors regularly determine lipid concentrations of their patients, but some of them do not measure Lp(a)—mainly due to underestimation of the problem “Lp(a)” or for financial restrictions. In high-risk patients, lipids should be checked at least twice per year. They should advise patients at risk to maintain a healthy lifestyle (especially no smoking). Usually they pay attention to possible concomitant diseases like hyperlipoproteinemia (elevation of LDL-C or/and triglycerides (TG)), hypertension, diabetes mellitus, slight renal insufficiency. Furthermore, regular vascular and cardiological examinations are important as well as a close cooperation with other specialists who may be contacted in case of complex situations, especially when progression of atherosclerosis has been documented. 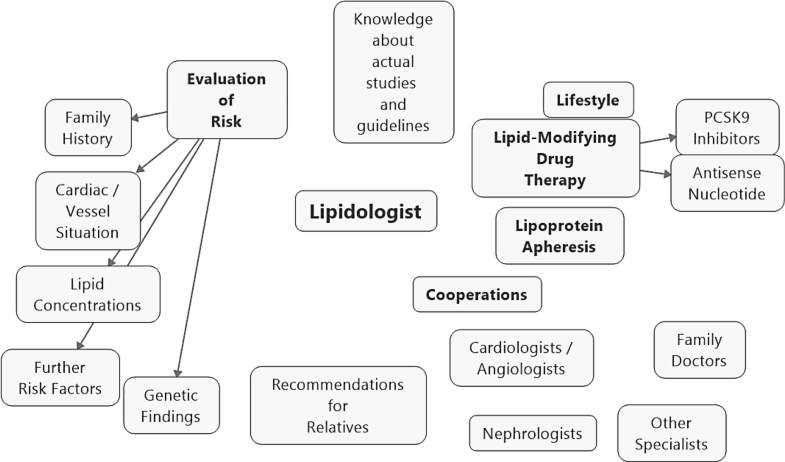 The major aim of referring patients to lipidologists is to improve the current risk situation with respect to lipoprotein concentrations (Fig. 4). The goal is to reach internationally recommended target levels for LDL-C—below 1.8 mmol/l (70 mg/dl) in high-risk patients . Statin therapy is often modified (increase in dose or switch to another statin when an intolerance is reported); sometimes ezetimibe is added. However, these drugs do not exert a decreasing effect on Lp(a) levels. Proprotein convertase subtilisin/kexin type 9 (PCSK9) inhibitors effectively reduce LDL-C levels and can be started in therapy-resistant patients (Fig. 4). PCSK9 inhibitors—decrease Lp(a) by a mean of about 20% (ranging between 0 and 44%); in some patients a reduction cannot be achieved. In two prospective controlled large studies, both evolocumab and alirocomab induced a modest reduction of cardiovascular events which was the consequence of decreasing Lp(a) levels—independently of the effects on LDL-C . Up to now, an elevation of Lp(a) is no accepted indication for this injection therapy. LA—when comparing the Lp(a) levels before initiation of the extracorporeal therapy with those measured during weekly LA sessions (interval mean values)—a decrease of about 50% is realistic. 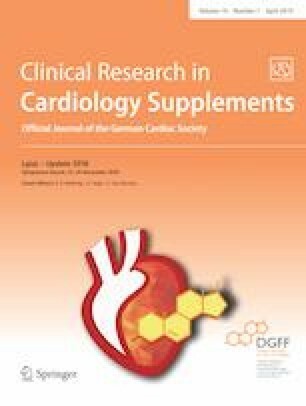 In two studies, cardiovascular events were reduced by about 80% [21, 22, 23]. This corresponds with the experience of other authors [24, 25, 26, 27]. A progression of atherosclerosis, either clinically or documented by imaging techniques . Lipidologists are required to assess the total atherogenic risk of a given patient before recommending LA treatment. Some lipidologists are allowed to perform LA themselves. Some health insurance companies require that their medical services supervise the indication for LA therapy in a few cases. The ongoing lipid-modifying drug and LA therapy are regarded as satisfactory when no progression of atherosclerotic lesions (no new events) occurs. Usually patients are seen in outpatient departments once every 3 months, in LA centers weekly. In the future, an antisense oligonucleotide against apolipoprotein(a) will probably be available [28, 29]. A phase III study will be started in 2020. However, outcome data are needed before this therapeutic approach will play a major role in daily practice. Some specialists do not measure Lp(a) concentrations; their lab budget is rather restricted. However, an increasing number of them pay attention to this parameter in patients who are at high cardiovascular risk (Table 1) and recommend the family doctor to measure Lp(a) or to send the patient to a lipidological center. According to German regulations, cardiologists/angiologists are authorized to prescribe PCSK9 inhibitors. However, this is currently only done in rare cases. The usual investigations like cardiac ultrasound and ergometry do not provide an exact follow-up of coronary atherosclerosis, while cardiac catheterization is only indicated under defined conditions and may lead to adverse events. Non-invasive techniques like computed tomography (CT) or magnetic resonance imaging (MRI) will most probably play an increasing role in the future. Aortic valve stenosis, which can be seen in patients with a high Lp(a) level, can be easily assessed by echocardiography. As any vascular region may be affected by atherosclerosis it is important to examine limb and carotid arteries and the aorta as well (Fig. 5). The current findings should always be compared with previous data—to document or exclude progression of atherosclerosis. Patients should be offered a date for the next examination—the interval (usually annually or biannually) depends on the severity of the arterial lesions. Most patients have to be persuaded to be followed-up. Of course, cardiac surgeons and vessel surgeons should send their patients for Lp(a) evaluation following invasive procedures. Renal diseases may increase Lp(a) concentrations. Other lipids are also influenced. 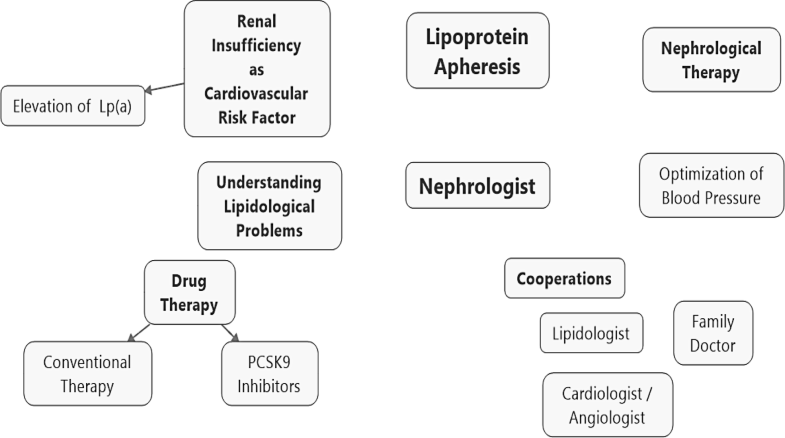 Nephrologists should regularly measure lipid concentrations and should treat disorders, if possible, in cooperation with lipidological and vascular specialists (Fig. 6). Nephrologists have the right to prescribe PCSK9 inhibitors and can apply for permission to perform LA therapy. Of course, in apheresis patients attention should also be paid to other risk factors. For application to start or to continue LA therapy lipidological and cardiological/angiological evaluations are required, which confirms the relevance of the mentioned close cooperation with other specialties (Fig. 2). Healthy nutrition is the basis for treating patients with lipid disorders. Though Lp(a) is not changed by nutritional factors, LDL-C and TG can be improved. Thus all high-risk patients with high Lp(a) levels should be advised. These specialists see patients with hyperlipidemia, metabolic vascular syndrome, hypertension, diabetes mellitus, obesity, and endocrine disorders. In these patients Lp(a) should be measured. According to the official rules, physicians who are specialists in both diabetology and endocrinology are allowed to prescribe PCSK9 inhibitors. In complex situations, consultation with a lipidologist is recommended. It is an accepted opinion that measuring Lp(a) once in a life-time is sufficient. However, as daily routine has shown that Lp(a) levels vary; patients with high levels or those who undergo Lp(a)-lowering therapy require repeated measurements . An ischemic stroke may be a consequence of an elevation of Lp(a), even in children [31, 32]. Neurologists should remember this cause, should measure Lp(a) and as a consequence should forward these patients to vascular or lipidological specialists. In very old patients Lp(a) does not have a prognostic significance—high-risk patients already die at a younger age, although with an increasing quality of medical care, the life expectancy of patients with high Lp(a) levels will probably increase. These patients will need continued medical care even beyond the age of 80 years in order to prevent new cardiovascular events. Pregnancies affect lipid concentrations. Data on Lp(a) are contradictory; sometimes an elevation was seen . Some authors suspected a relationship with pre-eclampsia . It appears to be possible that Lp(a) induces abortions [35, 36]. Hormone replacement therapy post-menopause will decrease Lp(a) concentrations . An elevation of Lp(a) is an inherited disease. In children of parents who suffered from cardiovascular complications associated with high Lp(a) levels this parameter should be measured, in older children an ultrasound examination of the carotids is indicated. When Lp(a) levels are elevated, follow-up assessments should be performed. Smoking should be avoided. In children with familial hypercholesterolemia appropriate therapeutic options should be started (statins, apheresis, etc.) according to the existing guidelines. Patients who suffered from cardiovascular events may need the help of a psychotherapist. The risk of new events is rather high. On the other hand, relatives of affected patients may worry about their own future. The Lp(a) levels are determined by the number of kringles–IV type 2 (low numbers are associated with high Lp(a) levels) and by certain mutations in the Lp(a) gene. The atherogenic risk of Lp(a) is depicted by its level—currently measuring the kringles’ number or looking for gene mutations does not play a role in medical practice. However, new findings in the future may change this attitude. Patients with previous myocardial infarction or stroke may have been in critical conditions needing intensive care. After recovery Lp(a) measurements in these patients are mandatory, especially in young age . 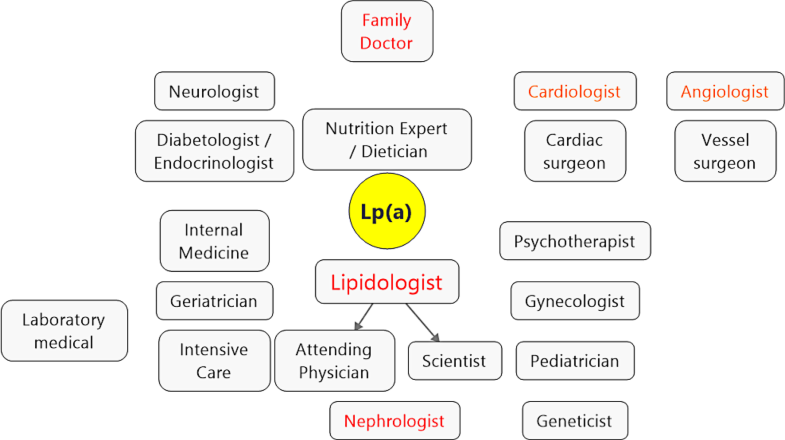 The German Lipid Association (Lipid-Liga) offers courses to acquire the qualification of a lipidologist. Lp(a) is an important topic in these courses. The number of these specialists is steadily increasing. However, there are regions where no lipidologist is available yet. Moreover, the German Lipid Association (Lipid-Liga) proposes a certification of lipidological outpatient clinics or lipidological competence centers and networks . Close cooperation with specialists working in the fields mentioned in this paper is an important feature of these structures. This Association also organizes symposia dealing with lipidological issues, sometimes in cooperation with other societies (internal medicine, cardiology, angiology, nephrology). An elevation of Lp(a) concentrations is associated with a high cardiovascular morbidity and mortality. High-risk patients need special attention. The German government is willing to spend money for these purposes and physicians should use the available diagnostic and therapeutic opportunities. All physicians caring for patients with lipid disorders should attend meetings where lipidological topics are presented. Thus a high degree of qualification will be guaranteed. Close cooperation of different medical specialties is needed. Lp(a) really represents an interdisciplinary challenge. U. Julius: honoraria from Aegerion, Akcea, Amgen, Amryt, Chiesi, Sanofi, Kaneka, Diamed, Fresenius Medical Care, MSD. S. Tselmin: received honoraria for lectures and consulting by Amgen, Fresenius Medical Care, Kaneka, MSD, and Sanofi-Aventis. U. Schatz: No conflicts of interest relevant to this publication. S. Fischer: honoraria from Sanofi, Amgen, MSD, Berlin-Chemie, Abbott, Boehringer Ingelheim. S.R. Bornstein declare that he has no competing interests.